Home » Blog » What’s Business Interruption Insurance All About? If your business is ticking along nicely, you probably don’t spend too much time thinking about what would happen if you suddenly had to close for a period of time. However, sometimes business as usual can come to an abrupt halt thanks to unexpected circumstances and these interruptions can have serious financial consequences. Luckily, you have the option of business interruption insurance to protect your business financially during these periods. If your business is unable to operate following an insured event, business interruption insurance will cover the profits that your business would have earned during the period where you’ve been forced to close. Although you might be able to cope financially if you had to shut down for a week or two, what would happen if you couldn’t operate for a whole month? Or several months? Depending on the insurable event which results in the shutdown of your business, there are circumstances where businesses can’t reopen for a long time and this could put a serious strain on the finances. With business interruption insurance, you can keep your head above water and give yourself the time your business needs to recover during the rebuilding process. When you take out your business interruption insurance, you need to decide how long your indemnity period will be. That is, you need to decide how long you want to receive cover while your business isn’t able to operate. Consider the specific risks associated with your business and how long you’d realistically need to recover if a worst-case-scenario insurable event occurred. The last thing you want is to nominate a very short indemnity period which just wouldn’t give you enough time if something went wrong. To help make an informed decision, have a chat to your insurance broker and they’ll be able to take a closer look at your specific situation. While your property insurance will cover the cost of damages caused by insurable events such as fire or storms, it won’t cover you for any lost income while your business is unable to operate. Although you need to have cover to help with any rebuilding or repairs via property insurance, you also need to have the peace of mind that you can financially cope until you can reopen by having business interruption insurance in place. 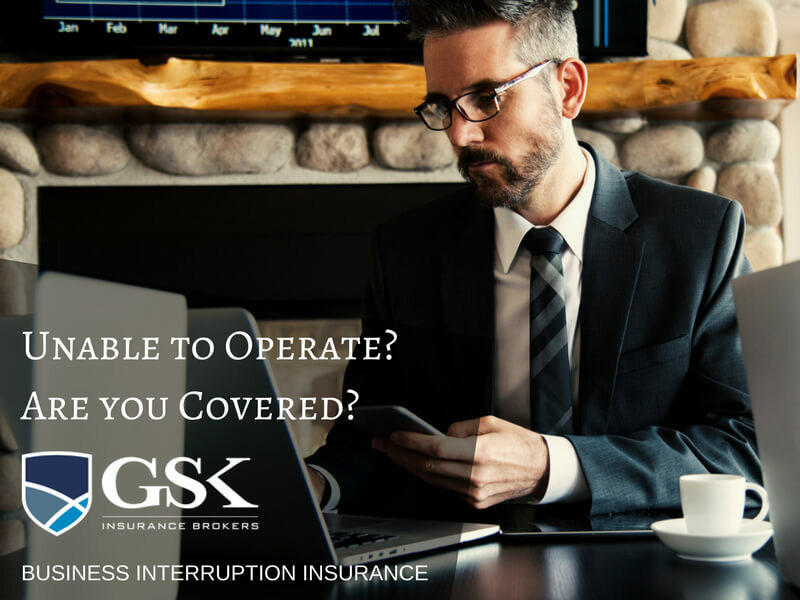 If you need business interruption coverage in place, contact the team at GSK Insurance Brokers. Our experienced team of brokers take the time to get to know your business and analyse your specific needs so you can be confident at that your areas of risk are covered. From helping develop your business owners insurance package to offering support at claim time, we’re here to offer our expertise for ultimate peace of mind. For business insurance brokers in Perth, speak with GSK Insurance Brokers today on (08) 9478 1933.